is with the terrific Canadian songwriter Claude Munson. He has been chatting with me about his record, The Silence Came After. I ask whether he has a standout from the album; which musicians he counts as influences – Munson recommends some new artists that are worth catching up with. 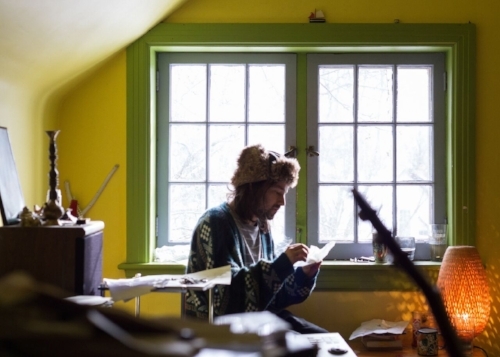 I ask whether gigs are on the cards and what the scene is like in Ottawa; if he is coming to the U.K. this year; how he spends time detaching from music; three albums that mean a lot to him – Munson reveals what he has planned for the remainder of 2018. Hi, Claude. How are you? How has your week been? Hey! I’m good. It’s been a busy and exciting week. 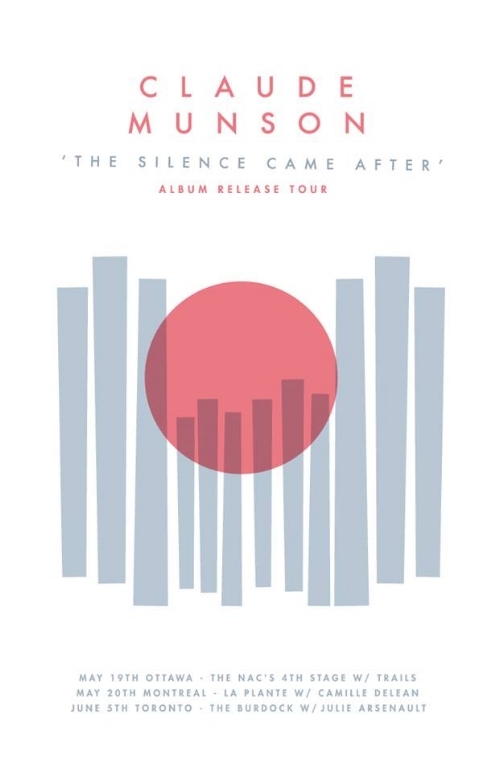 I just released my sophomore album, The Silence Came After, via Record Centre Records and performed a sold-out show at the National Arts Centre’s Fourth Stage. Happy that the album is finally out and available for the people - and happy to be performing more live shows. My name is Claude Munson and I’m singer-songwriter from Ottawa, ON. I perform in a five-piece band: two guitars, synths; drum and bass. Whether drenched in crystalline synths or stripped bare, I aim to write songs that tackle modern life and love with radical intimacy. Some people call my music ‘Impressionist-Folk’ or ‘Art-Folk’. The Silence Came After is out. Can you reveal the themes and ideas that go into the album? The Silence Came After is somewhat of an autobiographical record. I believe I'm trying to convey some truth about myself and my experience. One of the themes on the album is a kind of escapism and a constant need to run away from myself. I think, with this album, I confronted my past and learned more about myself in the process. My music is also a kind of therapy for me: I write songs to try to make sense of my heart and my head. Is there a track from the album you’d highlight as a favourite? Broken Stairs is currently my favourite track. The music video for it was just recently premiered on PopMatters the day before my album launch. For the video, we chose the concept of getting lost in your own city. I was inspired by my teenage years of walking and hiking around Ottawa and Hull with my friends. We would go out and discover graffiti walls and abandoned things like the old train tracks that cross the Ottawa River and bridge Ontario and Québec. Do you feel the record is your most realised and satisfying work? I do. We spent a few years making this album and did our best to not cut corners. Whether it was envisioning the album, writing; arranging or recording the songs, everything seemed to take longer than expected. I think it’s because everyone working on the record wanted it to be the best it could be. Each song is its own universe and they’re all treated uniquely. I’m proud of this album. Which musicians did you grow up around? Who do you count as idols? There are many, but I’ll try to keep it short! When I was younger, I would listen to old stuff like Billie Holiday and old Jazz records. I think this gave me an interest in singing melodies. In the early-two-thousands, Kurt Vile came to Ottawa and played Babylon nightclub. I was too young and too much of a dweeb to go to the show but I still bought his album, Smoke Ring for My Halo. I would always listen to this record before a writing session. War on Drugs’ early stuff painted a nice picture for me: I really like what was going on there. The Sea and Cake (from Chicago) had an influence on some of the writing on the album. Something about the momentum in the music really inspired me - this feeling can be found on Broken Stairs. Bruce Springsteen’s Nebraska made me want to write more intimate songs. I would listen to that album a lot. Worthy mentions: Bright Eyes, Mazzy Star; Elliott Smith, Devendra Banhart; Andrew Bird, Patrick Watson; The Shins, Sufjan Stevens; Wilco, M. Ward; Jeff Buckley, Van Morrison; Nick Drake, Tom Petty and Paul Simon. Sidenote: I’ve always been a big fan of Canadian Indie artists such Feist, Broken Social Scene; Stars, Bry Web; Chad Van Gaalen, Joel Plasket and Jen Grant. You are based out of Ottawa. What is the music scene like there? Are there a lot of great local acts? It’s quite eclectic compared to when I was a teenager. Ottawa is a city that is constantly growing and changing. I’ve seen venues come and go but I think that means there’s stuff happening and people are trying stuff to see what works. There are more music festivals then before (big and small) and more than enough opportunities for bands to book shows and play. There is a good musical community here and anyone is likely to find something they like. I think Ottawa needs more medium-sized venues as to attract more out of town acts and maybe some bigger names; that would really draw people out to go see more music. There are many great local acts I would highly recommend: Her Harbor, Scattered Clouds; Trails, Shadowhand; Keturah Johnson, Sparklesaurus and Pony Girl to name a few! Most probably! We are currently some shows to promote the album launch. We just played in Ottawa and Montreal this past weekend and we are heading to Toronto for a show at the Burdock on June 5th. Might you come and play the U.K. this year at all? It would be a dream! I love to be on the road and my goal has always been to play everywhere I can. I feel as though people in the U.K. would enjoy the record. Even though my name is Claude, all my lyrics are in English! For my album to reach more ears, to write more songs; to make more music videos, to take some time off and remember to be human. I want to play some shows in scary America and beautiful Europe - and start recording a new album. I also hope to be a better person every day and give back to the community. I miss the ‘jams’. I used to be part of a French band that busked in different towns in the South of France. We would hitchhike to a town, play in front of the cafes at night to buy food and drinks then sleep on couches at night…the vagabond days, I call ‘em. Those were my richest musical experiences to date. When I was very young living in Asia with my family (my father was CTV News correspondent), we had this album playing with us everywhere we went. Every time I hear any song on that album, I instantly feel at peace and calm. It’s such a musically-rich record, so much talent; there is something very romantic about the album. When I was learning how to sing and play the guitar, I made it my mission to learn as many songs off this album as possible. This album was always my feel-good go-to album. I love the way Paul Simon writes songs. I feel like there is a universal message of love and compassion in his music. I was listening to this album while deciding which demos I would bring to the band. Time It Takes, the last song of the album, is a bit of an homage to the crudeness of Nebraska. Believe in yourself. Go for it. The only thing holding you back is that silly voice inside your head. Be patient with your material. Create experiences that build up your self-confidence. Share your thoughts and feelings with others. Help yourself grow. Be proud of what you can do: don’t try to be like others: you can’t escape your own uniqueness so embrace it. I may be late to the game on this one but I just discovered Kevin Morby. Amazing stuff, Singing Saw: great song. Land of Talk from Montreal is also worth checking out. Her music is inspiring and her musicianship is out of this world. Great voice and guitar work. These days, not really, but that’s what I’m hoping for soon! Nature is a happy place for me so any kind of nature adventure is definitely my jam. In Ottawa and Gatineau we are surrounded by beautiful provincial parks so I try to go hiking and camping whenever I can. As a full-time cook, it’s hard to find the time. My family has a cottage in New Brunswicka (a province on the East Coast of Canada). I’m hoping to sneak away there for a week or two this summer to decompress, chill on the beaches; read, play the guitar and spend time with my extended family – and eat some lobster. Very basic stuff but very good for the soul. I wrote three songs on that beach for The Silence Came After: Madness, Love Comes Knocking and Sweet Love.